Due to being very busy this will be a short post. There are, however, two neat things I wanted to share. One of my favorite things about water is how scalable it is. 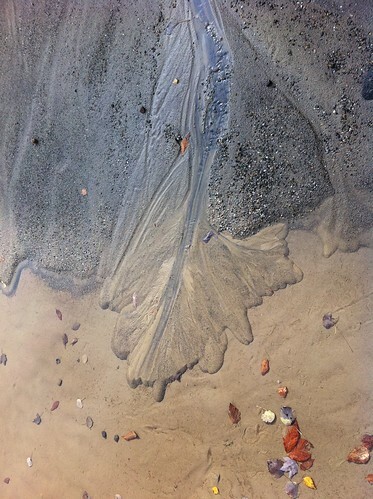 A small trickle in sand will act much the same was as the Earth's largest rivers do. Yesterday I was exploring a gravel pit for a geology class (and learning about eskers!) when I found this 'delta'. It had many of the same features of a large river delta. By altering the flow of the little trickle of water (creating a dam and then breaking it), we were able to watch the delta experience high water events, and shift its channels. Then, I lowered the level of the 'lake' about an inch by using a shovel to drain the puddle. 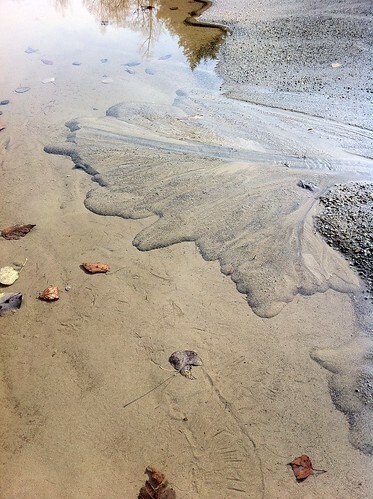 The water began cutting into the little delta and creating a new delta at the new water level. Soon, the entire geology class was involved. Unfortunately, as is usually the case when many humans are trying to modify the flow of water, by the time we left the little delta was mostly destroyed. Don't feel bad though because it rained last night and probably built itself back in that time. Speaking of which... the rain last night in Vermont was quite mild. I hear that in Pittsburgh, there was a moderate storm, but nothing particularly intense. The large weather system responsible for this was anything but mild in other parts of the Midwest, however. According to Jeff Masters' blog, this storm was the strongest on record in the interior United States in terms of barometric pressure (hurricanes and nor'easters can still be more intense than this storm was). It led to tornados, severe thunderstorms, and also winds near hurricane force on Lake Superior. There have been an awful lot of intense storms lately, perhaps due to long-term changes in the climate, or perhaps due to other factors we don't understand. There are some indications that this winter could be quite a stormy one, and may be a winter of very heavy snowfall in many places. It's time to prepare for winter, as the squirrels are doing right now as well. Beavers have been on my mind lately, as evidenced in the long post I made about them yesterday. As mentioned in that post, beavers have huge positive effects on watersheds, and their removal has caused drastic effects that we can't even understand the full effects of. I have wondered if beavers were present in some of the more protected perennial streams (or streams that would be perennial with beaver meadows) of southern California. In fact, today I found evidence that in fact beavers did inhabit at least one more wild southern California stream. Us humans sure have an inflated sense of importance! Since we are the ones who created pavement, rooftops, and channelized culverts, we think we are the only ones who can also work to slow down water with rain gardens, bioswales, and constructed wetlands. It's time to face up to the truth. There is another mammal who has been constructing wetlands and 'rain gardens' since long before humans even set foot in North America. In truth, they do a better job of it than us, too. Unfortunately, humans have done a good job of driving these animals away from much of the United States in the last 500 years. The good news is that they are already on the comeback, and all they ask in return for their work is a little bit of space, tolerance, and some delicious aspen and willow to chew on. Although there are many sub-watersheds within every watershed, it is very rare for an area to be part of more than one watershed. Water that falls on the Earth and flows downstream generally has only one possible path to follow as it flows downhill (unless it evaporates or is used by living organisms). In particular, it is quite unusual for a pond to drain into two watersheds. For this to happen, the pond has to be right on the peak of a drainage divide! (If you think of a watershed as similar to a tree, a pond draining into two watersheds would be like a single apple growing on two trees at once). 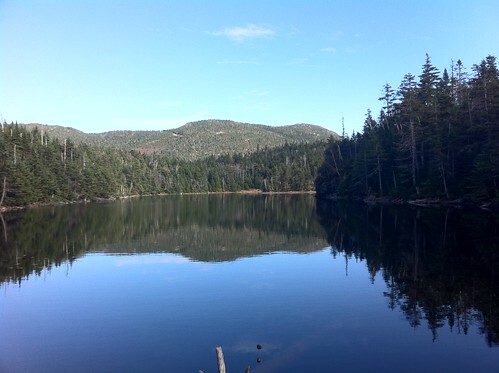 However, in Vermont, there is a pond called Sterling Pond that is perched right on the main divide of the Green Mountains! Water from this pond flows both into the Winooski River (via the east side of the mountain range) and the Lamoille River (via the west side of the mountain range). It sounds absurd to say, but in effect it is true, if you define spring as the season of growth and renewal. The first rains of the cold season have arrived in southern California. Click below to read more about the turn of the seasons in the place I lived before I moved to Vermont. On September 30 and October 1, heavy rains affected much of the east coast from North Carolina to Vermont. In eastern North Carolina the rains were extremely intense, and some areas received more than 20 inches of rain! The rain was not quite as severe as that in Vermont but most areas still received over 3 inches of rain (there were around 3 inches of rain in Burlington, 4 in Middlebury, and around 5 in Rutland, for instance. Christopher Bert, an extreme weather expert, has named this rain event 'Super Rainstorm Nicole' because it was in part fed by short-lived Tropical Storm Nicole. Visit this blog for more info on this storm and its similarities to rainfall associated with Hurricane Hugo in 1999.